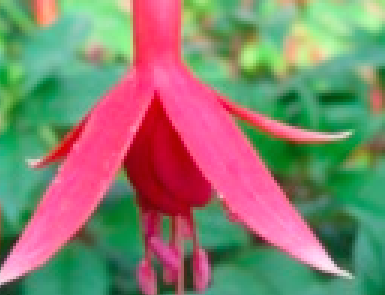 Cool name for a cool garden Fuchsia. To 2′ x 3′ in a single season. The large, single flowers are “selfed”. That is both the sepals and corolla are the same color of soft red. Very profuse blooming and the large flowers have exceptional grace. Cold hardy, easy to grow Fuchsia that is also remarkably heat tolerant. Full sun to quite a bit of shade in rich, moisture retentive soil that drains. Regular summer water speeds growth and enhances bloom. Plant deeply for added winter protection in the first season and mulch with compost the first autumn. Add a handful of all purpose organic fertilizer in spring- Fuchsias dearly love fertilizer. Freezes to the ground below 26ºF, resprouts vigorously from the base in spring. Do not cut back until new growth emerges in spring. Very cold hardy. Full sun only with regular summer water. Avoid reflected heat.